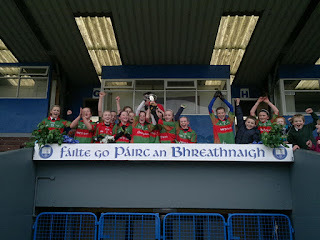 Pictured above is the girls U13 Football team recieveing the trophy after the final. Well done to everyone involved. Our 3rd, 5th and 6th classes completed a swimming course and they all received certificates. Also the boys u13 football team and the girls team are both in Eastern Finals to be held in Walsh Park soon. We wish good luck to both teams! The girls also won the local mini-7's and are in the Eastern Final for that too. Lately a drumming workshop was held in the school which went very well and we thoroughly enjoyed it. Thanks to everyone who supported our fund raising events throughout the year, it was thanks to proceeds from that fund raising which made the drumming workshop possible, so well done. We look forward to the upcoming Red Kettle Theatre Production for our children.